With NFL football back, all seems right and well in the world again. The first week of play really delivered and there was no shortage of excitement this opening Sunday. This will serve as a recap of anything you may have missed in the opening week as well as what to watch for in the upcoming week of football. The season opener last Thursday, Sept. 6, was a true defensive battle to kick off the season. Many questioned if the reigning champions, the Eagles, would be able to back up their dominant Super Bowl run without star quarterback Carson Wentz and wide receiver Alshon Jeffrey to kick off the season. Nick Foles, however, proved he was competent enough to lead one of the deepest teams in the NFL to an opening win over the Falcons. Foles was by no means great, but he did what he had to do and the Eagles’ defense was phenomenal in holding the potent Falcons offense to just 12 points. After proving stout with a last-minute goal line stand, the Eagles came out on top 18-12 at home. This game being played in Cleveland gave it the makings of one of the more interesting matchups of the opening weekend. Additionally, LeVeon Bell’s hold out only further complicated things for the reigning AFC North champs, the Steelers. This was a game that truly seemed like nobody wanted to win, which is what occurred in the end as the teams walked out of Cleveland with a 21-21 tie. Backup running back James Connor filled in wonderfully for Bell with two touchdowns and over 190 total yards from scrimmage. Meanwhile, Ben Roethlisberger was terrible with three interceptions to go along with two lost fumbles. If Big Ben can’t return to prior form, the once dominant Steelers could see major regression, while the Browns look like a team trending upward. The high-powered Chiefs’ offense looked even better this weekend than it has in years past under new Quarterback Patrick Mahomes who threw for four touchdowns, two of which were to speedster Tyreek Hill who amassed 169 receiving yards and also took a punt 91 yards to the house on his first touch of the season. The Chiefs’ defense definitely will be an area of concern as they allowed over 500 yards offense to the Chargers, but if they can continue to put up points the way they did in LA in their 38-28 victory, the Chiefs will be a force to be reckoned with again this year. This game was truly a tale of two seasons. In 2017, the Bills snuck into the playoffs thanks to a terrible Ravens loss to the Bengals in week 17. This year, however, the Bills look like they’ll be the worst in the league while the Ravens look like legitimate AFC contenders. Bills quarterback Nathan Peterman completed just five of 18 passes for 24 yards to go along with two interceptions before being benched in the second half for rookie Josh Allen. The Ravens, on the other hand, looked awesome on both sides of the ball. Joe Flacco threw for three touchdowns to each of his three new wide receivers and the dominant defense was breathing down Bills quarterbacks’ necks all afternoon. The Ravens came out on top 47-3 and sat most of their starters midway through the third quarter in preparation for their Thursday night matchup with the Bengals in Cincinnati. The Sunday Night Football game was undoubtedly the most exciting of any this weekend. The new-look Chicago Bears looked like a dominant force in the first half under new head coach, Matt Nagy. 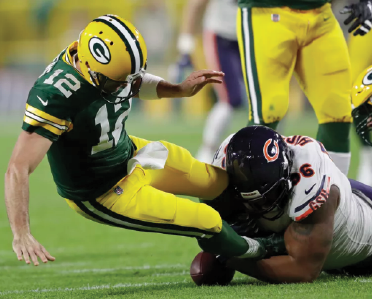 Second year quarterback Mitch Trubisky was firing and the defense, led by new acquisition, Khalil Mack, was smothering the Packers. They even knocked Aaron Rodgers out of the game early in the first half with a leg injury, which appeared to spell disaster for Green Bay. With a 17-0 halftime lead, the Bears were in complete command. Aaron Rodgers somehow managed to come back, albeit hobbling on one leg, in the second half with a 20-0 deficit. Rodgers being Rodgers though led a miraculous comeback which included a 75-yard touchdown pass to Randall Cobb with two minutes remaining to win the game 24-23. Week 2 has plenty of intriguing matchups to watch for, including big divisional games between the Ravens and Bengals, the Panthers and Falcons and the Vikings and Packers. Additionally, the Chiefs and Steelers matchup in Pittsburgh should give a good indication of who some contenders and pretenders are in the AFC.